Note for tellers: This is a version of a story that can be told on any occasion that calls for a "scary" story. Children eagerly join in with the teller and participate with eyes wide open, waiting to see what will happen. However, unlike many scary stories, this one will leave them laughing instead of having nightmares. Not too long ago, a woman was driving down a lonely road with no one in the car except herself. It was totally dark outside. Even the headlights of her car could not penetrate the storm that she drove through. Sheets of rain poured down on her winshield, making it impossible to see where she was driving. CRASH! A flash of lightening hit right in front of her car. She turned the wheel in fright and drove right into the ditch. The woman wasn't hurt, but she was angry. She put the car in gear and tried going forward and backward, but with no luck. The tires spun in place, throwing mud out the front and back of the car. The woman got out of the car and slammed the door. She saw that one tire was flat, and she kicked it! The tire fell off the car. She stomped her foot. Her shoe heel broke off. She jerked her suitcase out of the can, and it flew open. Every piece of clothing in the suitcase flew out of the case and into the muddy field. A flash of lightening showed a town in the distance. So, the woman angrily limped into the town. She stomped into the lobby of the only hotel in town and stood alone at the entrance. As her eyes adjusted to the light, she saw the desk clerk behind the desk. He was leaning back in a chair and was fast asleep. She walked to the counter and tapped lightly on the counter top. "I need a room," she stated. "ZZZZZZZ," was the only reply she heard, as the clerk continued to snooze. So, the lady reached over the counter and grabbed him by his tie and shouted, "WAKE UP! I Need a Room!" "Oh," said the man, as he adjusted his tie, "You must need a room!" "That's what I said," repeated the woman. "I need a room." "Well," started the desk clerk, "On a normal day, this would be good, but tonight, there are no rooms available." "I want a ROOM!" the woman said again, angrily. "There are no rooms, but you can sleep on the couch in the lobby," said the clerk. The woman had wrecked her car. She had lost a tire. She had stomped the heel off her shoe. She had lost all of her clothing to a mud filled field, and now she was being told to sleep on the couch. "You don't get it!" she said. Then she leaned over the counter once more and grabbed the poor man's tie. She pulled his face towards hers until her hot breath could be felt on his cold, terrorized face. " I want a room," she stated again. My car is a wreck, I need a room for tonight and a mechanic for tomorrow," she said in a low, firm voice. "Lady, the mechanic isn't in town, and there is only one room left in this hotel, and you DON'T want it! It's haunted," stammered the desk clerk. She leaned over the counter and grabbed his tie again. "Give me the key to the room," she said in a threatening voice. The desk clerk gave her the key along with towels, washcloths, soap, shampoo and a terrycloth robe for her to wear. She let him go and walked up the stairs to go to her room. Once in her room, the woman took a warm shower and washed out the clothes she had been wearing. She put on the warm robe and climbed into bed. 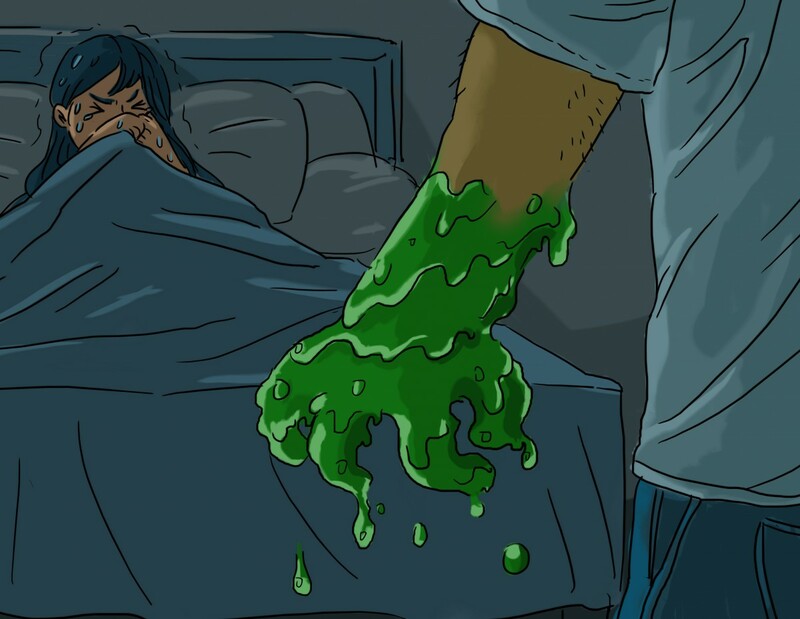 She was almost asleep when just at the stroke of midnight, a huge hulking figure came out of the closet and was lurking and leaning over her bed. "Guess what I can do with my slimy green fingers and juicy red lips?" the figure said. "Ha, ha, ha, ha, ha!" "Ahhhhh!," The lady screamed and ran out of the hotel room, waking everyone in the hotel. People came to see what was the matter. They checked the room, but nothing was there. They looked in the closet, but nothing was there. They checked under the bed and everywhere in the room, but nothing was there. "Lady," you are crazy they told her, "Go back to bed, and don't bother us again. The poor woman couldn't sleep the rest of the night even though nothing happened. Just at the stroke of midnight, a huge hulking figure came out of the closet and was lurking and leaning over her bed. "Ahhhhh!," The lady screamed and ran out of the hotel room, waking everyone in the hotel again. People came to see what was the matter. Once again they checked her room, but nothing was there. They looked in the closet, but nothing was there. They even knocked on the walls trying to find hollow spots, but nothing was there! "Lady, go back to bed, and leave us alone!" the people said angrily. The woman went back to her room, but she could not sleep the rest of the night. The next day, the woman found out that her car repairs would be done in one more day. This would be her last night in the hotel. She thought she would be able to sleep that night. But, just at the stroke of midnight, huge hulking figure came out of the closet and was lurking and leaning over her bed. "I give up!" shouted the woman. "I am tired of being scared. Go ahead and show me! What can you do with your silly slimy green fingers and your stupid juicy red lips." And that was the last that anyone ever saw of him!